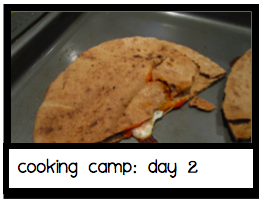 Cooking Camp was entertaining again today... and probably more of a learning experience for me than my little guy. I was totally humbled when I became one of those people that had to Google, "how do you boil a hard-boiled egg?"... after my first attempt wasn't so successful. Does anyone else want to come teach my kids how to cook? I'm obviously not the right person for the job. I specialize in dessert! I haven't boiled an egg since Easter. 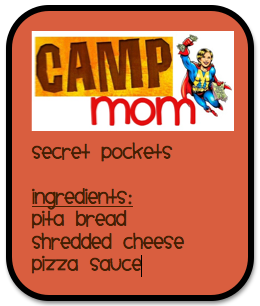 Secret Pockets are quick and easy. 1. Preheat the oven to 400 degree. 2. Have little chef secretly stuff the pita full of sauce. Tell him if he's sneaky enough you won't even be able to catch him doing it. The other simple task of the evening was boiling an egg. Simple being the key word... which it was not. We talked about high/low again as we turned on the stove, and cold/hot as we filled up the pot with water and started to let it boil... we also reviewed liquid/solid as we talked about how the inside of an egg is liquid before it is cooked... and solid, after it is hard-boiled. One of the eggs looked like this... which was pretty awesome. And then we finally got an actual hard-boiled egg. Hurray! While we boiled the eggs, we painted sails for the sailboats and then we stuck stickers on them. Aren't these adorable? The peppers would've been wasted though... since I'm the only one who likes them... hence the paper sails instead. Great day and the little man still loves cooking! Alright... I'm off to finish getting ready for Little Chef Camp tomorrow. Wish me luck :) Especially with the teething, grumpy, trying to crawl, baby in tow. Haha...I can relate to the whole kid-not-eating-unless-it's-called-something-different thing.